It's day one of the finest five days in Flat racing and the Bets of the Day team are eager to start the week with some winners. Read what Alan Dudman, Nick Shiambouros and Alan Thompson have to say about today's races and follow them throughout the week..
"I was encouraged by Ryan Moore's thoughts on riding Yucatan in his Royal Ascot Day One Preview about the drop down in trip to 1m2f and first-time cheekpieces." The meeting and first day starts with a Group 1 bang, and I am hoping to get off to a decent beginning with Saeed bin Suroor's Benbatl. This looks an open race, and I can leave alone Rhododendron as I am not massively convinced about the form of the Lockinge. The 5/1 Sportsbook price on Benbatl seems more than fair, as after all, he is the best horse on ratings here with a 123 figure - a mark that came from taking his form to a new level out in Meydan. He has to prove that now on home soil - and I think he can. I liked him as a three-year-old, but as a Dubawi he could be even better at four. He has raced over further and drops back down to the mile today, but he has more than enough speed and ran a sub-12 second last furlong when scoring on World Cup night, the pace is there. Benbatl also won at the Royal Meeting 12 months ago. I've been left frustrated with Aidan O'Brien's Yucatan on a number of occasions - and no fault of the horse may I add, it just seems the dice never seem to land his way. He's a horse who needs fast ground - and for that reason I'll give him a chance in an open race. The [10.0] price very much appeals for a one-time Derby contender. Indeed, his juvenile and three-year-old form makes him a serious player in this, as the Wolferton represents a drop in class for the horse. We have to ignore his run in the Coronation Cup last time as the ground wouldn't have been to his liking at all, and he ran no sort of race behind Cracksman. I was encouraged by Ryan Moore's thoughts on riding Yucatan in his Royal Ascot Day One Preview about the drop down in trip to 1m2f and first-time cheekpieces. The track could also play to his strengths. Lady Aurelia returns to see if she can make it three consecutive winning years at the Royal Meeting, after winning this race last year and the Queen Mary in 2016, she has some stiff opposition this time around from Australia and also the home side's Battaash. While she was disappointing on her return last month, she should build on that and this meeting certainly brings the best out of her. She is short enough in a field like this but I am sure Wesley Ward will have her right and assuming he has, and she returns to her best on this fast ground, she's going to be tough to beat. As mentioned above I think the Prix de l'Abbaye winner Battaash is the main danger to the selection. But he's a quirky type and has to be watched in the preliminaries, he lost the Nunthorpe at York last season due to his antics. However, when he wants to be he's a special talent, impressively winning at Chantilly in October. He also made a winning return at Haydock last month and if he manages to keep calm before the start, he's the main threat. With 20 runners going to post the Ascot Stakes is the first of the difficult handicaps of the week to try and work out but using the Sportsbook EW edge facility to increase the number of places you can still get a decent price and create the advantage required to make a profit. The race is run over the same trip as the Gold Cup and the Willie Mullins team certainly know what it takes to win this, having won it three times in the last six years and they have another strong hand this time, with five of the first eight in the market representing the yard. On each of those last three winners it was Ryan Moore doing the steering and this year they combine on Chelkar who is sure to be popular in the betting market. However, it is another Mullins runner further down the betting market that I think could be the one to beat. I like the look of Lagostovegas after finishing third in the Cesarewitch last autumn, she has been running in some very decent company over hurdles this year. She will have no stamina problems, has a first time hood fitted to keep her foucsed on the job in hand and thanks to Ryan Moore on Chelkar, I think she is a decent price and with 6 places available using the EW Edge facility, and still getting 7/1, I think that represents a bit of value in a very tricky contest. I think Cosmic Law could run well at a decent price in this fascinating contest. This colt by No Nay Never beat Usain Boat in the Woodcote at Epsom earlier this month. He took the lead a furlong from home, and pulled clear to win with complete authority. This was his best effort to date, and is improving at a rate of knots. I think he has a lot more to offer and represents super Each -Way Edge value (5 places) at 15/2 on the Sportsbook. Calyx heads the market at 5/2. He was most impressive on debut when beating Octave at HQ earlier this month. He quickened smartly inside the final furlong, and settled the race in a few strides. This is much tougher but he is the big improver in this race. Tip Two Win is my idea of the winner of this historic race. This colt put in a much improved effort when finishing second to Saxon Warrior in the 2,000GNS at HQ last month. He ran on really well inside the final furlong, but could not get to grips with the impressive winner. I think he is sitting on a big effort, and should go close. At present he is trading at [6.2] on the exchange. John Gosden sends out unbeaten Without Parole who is currently trading at [4.3] on the exchange. The well related colt has a fair bit to find on the book, and represents poor value in my opinion. 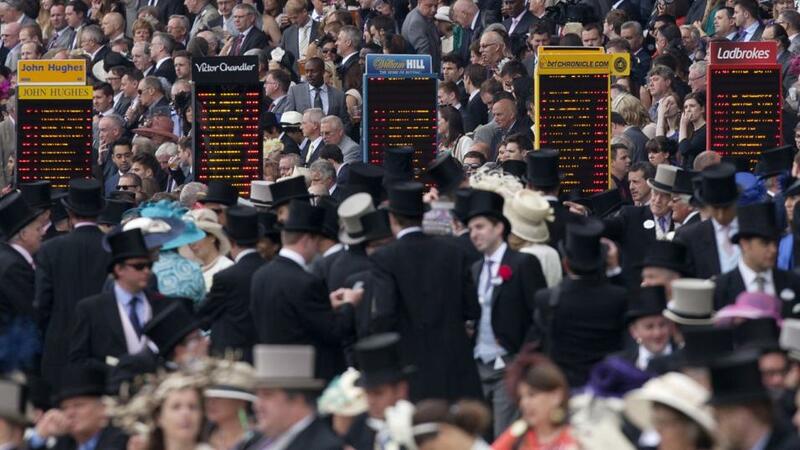 Royal Ascot Day One Tips: Dream start on Tuesday?